HomeNew CarsNews#2015GenevaMotorShow: Koenigsegg Agera RS is here! 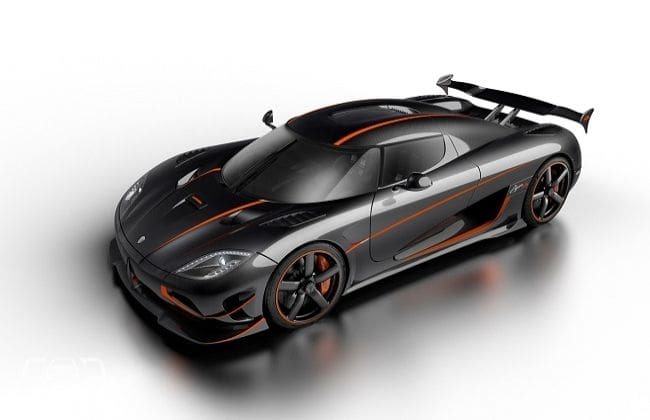 Another potent version of Koenigsegg Agera supercar has been officially revealed at the on-going Geneva Motor Show. Called the ‘Agera RS,’ this is a stripped-and-whipped version of the successful ‘Agera R,’ and offers a mighty 1160 bhps to be explored on the tarmac. The Agera RS benefits from a number of technological enhancements from its elder sibling- One:1. These includes light-weight carbon-fiber components, aero components for boosting downforce (up to 450 kg at 250 kmph), front splitter & winglet, side skirts, and a dynamically active rear spoiler. Its wheels are sized 19 by 9.5 inches up front and 20 by 12.5 at the rear, while the curb weight is stated to be 1390 kg. Powering the RS is an uprated version of the 5.0-litre V8 mill that has been optimized for regular pump gas and now puts out a whopping 1,160bhp, as compared to the 960bhp of the Agera R. However, the E85 flex fuel capability hasn’t been dropped completely and will be able to choose this option for even higher power outputs in certain markets. It retains the company’s 7-speed paddle-shift transmission with auto shift mode Koenigsegg Electronic differential. “The Agera RS ‘pushes the boundaries and takes the Agera to all new levels of performance,’ utilizing advanced technologies from the One:1, while maintaining ‘all the features and functionalities of previous S and R models,’ stated the company. Koenigsegg will build only 25 examples of the Agera RS, out of which 10 have been pre-booked. And alongside the new Regera, the company for the first time will make two distinct models simultaneously. Though Regera is more aimed at buyers seeking a luxurious performance car and the above mentioned Agera RS is positioned as an ultimate track-focused offering.